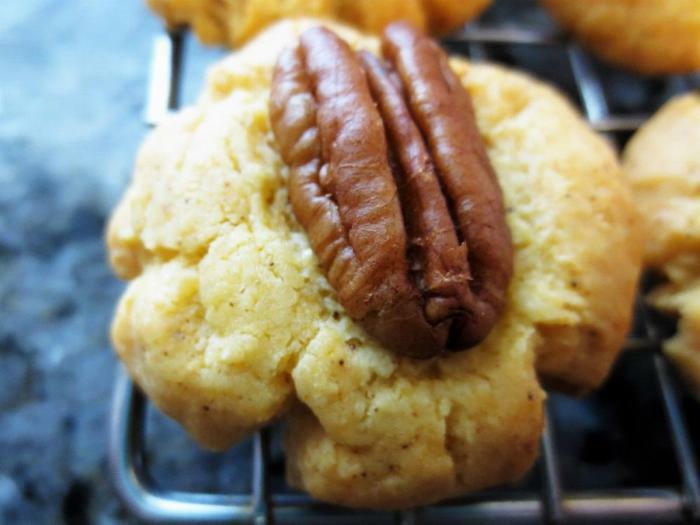 These wonderful cheesy, spicy little cookies are always a great hit at parties and receptions. Think of them as the perfect combination of cheese and crackers. Just be sure that you include a sign to tell people that these are not sweet! I give directions below for what kind of chile powder I use; you can use whatever you like and/or have on hand. Adapted from a recipe in The Washington Post. 2Preheat your oven to 375 degrees. 3Grate the cheese in your processor. It's fine to use the coarse side of your grating disk, as everything is going to get ground up by the blade. Dump your grated cheese out into a bowl. 4Put the flour, salt, baking powder, and chile powder in the bowl of the processor and pulse a few times to combine. Then scatter the butter, cut into smallish cubes or slices, over the top of the dry ingredients and process until the mixture looks crumbly and there are no big butter chunks. 5Dump the grated cheese on top of this mixture. I have a large processor with the capacity of 16 cups, and the cheese almost fills it to the top. If your processor is smaller, you'll probably have to mix in the cheese in a couple of additions. You'll end up with a smooth, pale-orange dough. 6Portion out the dough into 1/2-ounce balls. I use my trusty kitchen scale for this, as I want them all to be the same size. If you don't have a scale, aim for one-inch balls. Roll between your palms and press a pecan half into each ball, squashing it down somewhat. This recipe makes a ton, so if you don't have three baking sheets you'll have to bake them in batches. I get 25 per 12 x 18 baking sheet (of which I own six). 7Bake for 20-22 minutes. You want these to be golden brown on the bottom and ever-so-slightly brown on top. The original recipe called for these to be rolled out and cut with round cutters, but I just can't stand to do that! So my baking time is significantly longer than the original because these are much thicker than rolled-out cookies. If you want to roll out the dough, get it to about 1/4-inch thickness and bake for 10-12 minutes. But I promise you that my method is much easier and makes very pretty little cookies. *The original recipe calls for 1/2 to 1 tsp. cayenne pepper, which I don't like, either in taste or price. You could also use just plain old chile powder if that's what you have. A tablespoon of that, depending on its heat, would probably be about right. **Yes, you read that correctly--2 sticks, or 1 cup, of butter. These are party cookies! ***I use Tillamook sharp Cheddar from Costco, which comes in 2.5-lb. blocks. Since I'm almost always making these for a party, I make a double recipe and just cut the block in half, so I end up using 1.25 pounds per batch, making them extra cheesy. No one's complained!